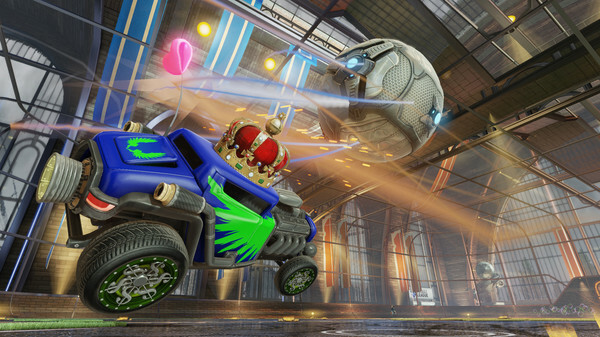 Rocket League is the successor to Supersonic Acrobatic Rocket-Powered Battle-Cars, which is a mouthful of a name. SARPBC (for short) originally released by Psyonix Studios on PS3 back in 2008, and I’d never heard of it. When Rocket League recently was announced for PS4, I was able to get into the beta for the game, which was so awesome they ended up doing a second beta as well. 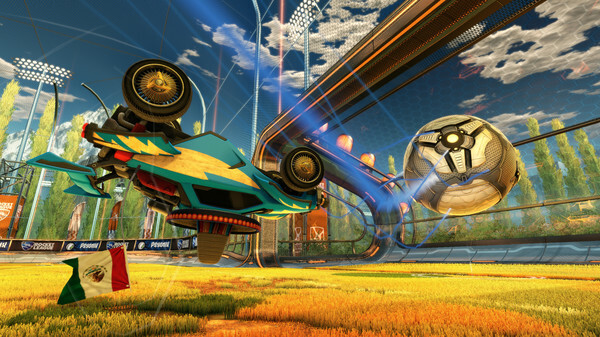 Rocket League (and it’s counterpart SARPBC) are physics based arena soccer games. The catch is that you’re controlling the action by piloting around in race cars. They are acrobatic though, as the former PS3 title would suggest. You can power slide, double jump, and flip your car around mid-air to deflect the ball, or strike the ball into the goal. There is a boost mechanic that when used properly can actually “sail” you through mid-air for some ridiculously awesome goals. But let’s get down to basics. The game has a few modes: Season, Exhibition, and Online Play. Season Mode is you against AI in team based battles, much like any Season mode sports game. Exhibition is a one-time match against AI, which I essentially look at as Practice Mode. There is an actual Practice mode where it helps teach you the mechanics of the game and allows you to get your feet wet before jumping into a Season or Online game. Then there is Private Matches where you can play against your friends in up to 4v4 matches. And the holy grail of the game is Online Play. Online is where the game ultimately shines and it shines bright. The game offers 2v2, 3v3, and 4v4 unranked modes, and then there are three ranked modes of 1v1, 2v2, and 3v3. Unranked modes still earn you XP, which changes your “rank” from “Rookie” to “Semi-Pro” to “Pro” and then “Veteran.” I think that’s more for balancing matches as it tends to try and keep you with similar leveled players. That said, you can still end up in a completely unbalanced game and get beaten easily. The AI Bots are also pretty OP, so if you end up with an AI on your team you’d be surprised how often they score goals. There are several arenas to play in, though currently it’s selected at random. That’s more an aesthetic thing as the arenas are the same shape and size. The Verdict: The game provides a TON of replay value, with couch style multiplayer (up to 4 people), or online multiplayer (4v4, or private online matches with 8 people). There are a variety of vehicles to unlock and use, and then another series of sets of car accessories to pimp your sweet ride with. With the PC cross-play support it’ll have a good system to keep PS4 players and PC players going with a larger player base than if it were PC or PS4 only. Occasionally you can get some lag spikes, but I’m sure as time goes on those woes will start to fade as they deal with high-pinging players. It was free the first month of PS Plus, but at $19.99 on PS4 and PC it’s definitely a fun game that has similar intensity moments like old school Mario Kart 64. Pick it up, and get in the League! Buy Rocket League PC(Steam) / PS4! Rocket League Website!